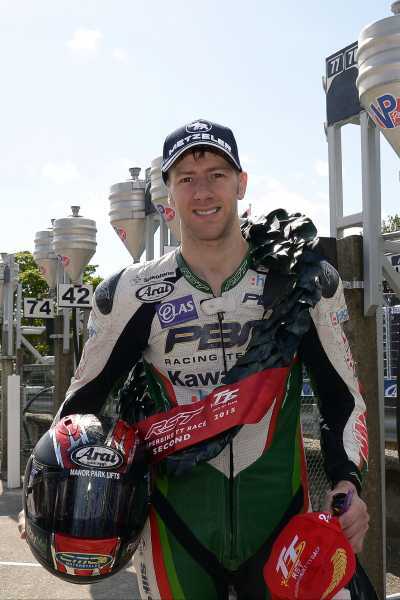 Eight-times TT winner Ian Hutchinson very nearly added a ninth victory after a sensational performance netted him second place in today's six-lap RST Superbike TT. Aboard the Penrith-based Paul Bird Motorsport Team's Kawasaki ZX-10R that he took to a superb podium placing at the recent International North West 200, 35-year-old 'Hutchy' from Bingley in West Yorkshire defied the changeable conditions to lead on the opening lap with a stunning average speed of 130.959mph. Over the next two laps, Hutchinson gradually increased his lead over Kiwi Bruce Anstey to over five seconds but as the race progressed, Anstey upped the pace to eventually take his first big bike victory with Hutchy crossing the line just over ten seconds back in second place with a final lap of 131.076mph. Third place went to James Hillier after Michael Dunlop crashed out at The Nook within sight of the finish when set for the final podium spot. "I got away well and just tried to settle into it and was happy with my pace over the first couple of laps. The first pit stop went well but then halfway through the race it started raining on the west of the Island which unsettled me a bit. When you've had thirty operations on your leg and you're flat out on a superbike with slicks on in the wet, it makes you think twice! The positions started to change and I gave it all I could on the last couple of laps but Bruce did enough to win and I'm pleased for him. But for me to come back here and be so competitive, this is the first time I've raced at that kind of pace for five years now I couldn't expect too much, I can only get stronger from now on. The bike and team is capable of winning so there's a lot more to come." Hutchinson will be in action on the PBM Kawasaki in the RL360 Superstock TT over four laps starting at 10.45 tomorrow (Monday 8th June).